Merrkiyawuy Ganambarr-Stubbs is a proud Yolŋu woman and leader from northeast Arnhem Land. She has written six books. Four of her books are written in Yolŋu Matha for use in primary schools as Walking Talking texts. She has played an important role in the bilingual education movement in Arnhem Land working with Yolŋu Elders to develop both-ways learning. She has developed a series of Yolŋu curriculum materials currently in use in Arnhem Land. 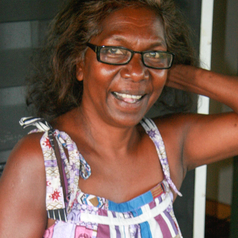 She has also been an important voice for Yolŋu, particularly against the NT intervention. In this capacity she has regularly appeared on television and on the internet. She is currently the Principal of Yirrkala Community School. Her vision is that every child is appreciated, and that every child knows that dreams are possible. Merrkiyawuy is a member of an Indigenous-academic collaboration with academics from Macquarie University and the University of Newcastle and is an Honorary Associate of the Department of Environment and Geography at Macquarie University.